Trade Netflix CFDs, other major shares, indices, forex, commodities and cryptocurrencies through Capital.com’s award-winning platform. No commission. FCA and CySEC regulated. Up to 1:200 leverage (professionals only). Available on web and mobile. AI technology. Trade now. Netflix Inc. is an American media-distribution service provider of internet television, founded in 1997 and headquartered in California. The company operates through three segments: domestic streaming (within America), international streaming and domestic DVD. The members of this service can watch original series, documentaries, feature films and television shows directly on their computers, mobile devices and internet-connected screens. As of 31 December 2016 Netflix had members streaming in over 190 countries worldwide. Netflix trading occurs on the NASDAQ stock exchange between the hours of 09:30 and 16:00 (EST). An individual has two options when trading Netflix stock. Firstly, they can invest in Netflix stock on the exchanges where they are listed. For instance, you can buy Netflix stock on the NASDAQ exchange, so you actually own a share in the company. This can be considered a long-term Netflix stock investment, as the individual is usually waiting for the price to rise over time. Alternatively, they can trade a contract for difference (CFD) on a particular stock, and speculate on the price difference of the underlying asset, without actually owning the asset. A CFD is a financial instrument typically between a broker and an investor, where one party agrees to pay the other the difference in the value of a security, between the opening and closing of the trade. You can either hold a long position (speculating that the price will rise) or a short position (speculating that the price will fall). This is considered a short-term investment or trade, as CFDs tend to be used within shorter timeframes. The key difference between trading a long position with a CFD and buying a security is the leverage that is employed. CFDs are traded on margin, which means that a trader can open larger positions with their capital. Advanced AI technology at its core: A Facebook-like News Feed provides users with personalised and unique content depending on their preferences. If a trader makes decisions based on biases, the innovative News Feed offers a range of materials to put him back on the right track. The neural network analyses in-app behaviour and recommends videos, articles, news to polish your investment strategy. Trading on margin: Providing trading on margin (up to 5:1 for individual equities), Capital.com gives you access to the stock market with the help of CFDs. Trading the difference: When trading a Netflix CFD, you don’t buy the underlying asset itself, meaning you are not tied to it. Unlike Netflix stock trading, you can speculate on the rise or fall of the Netflix stock price. CFD trading is nothing different from traditional trading in terms of strategies. A CFD investor can go short or long, set stop and limit losses and apply trading scenarios that align with their objectives. All-round trading analysis: The browser-based platform allows traders to shape their own market analysis and forecasts with sleek technical indicators. Capital.com provides live market updates and various chart formats, available on desktop, iOS, and Android. Focus on safety: Capital.com puts a special emphasis on safety. Licensed by the FCA and CySEC, it complies with all regulations and ensures that its clients’ data security comes first. The company allows to withdraw money 24/7 and keeps traders’ funds across segregated bank accounts. Netflix was founded in California by Marc Randolph and Reed Hastings in 1997. By July 1999 the company had raised $30 million in venture capital, and that September launched its DVD rental monthly subscription concept. The Netflix stock history is relatively short compared to some companies. 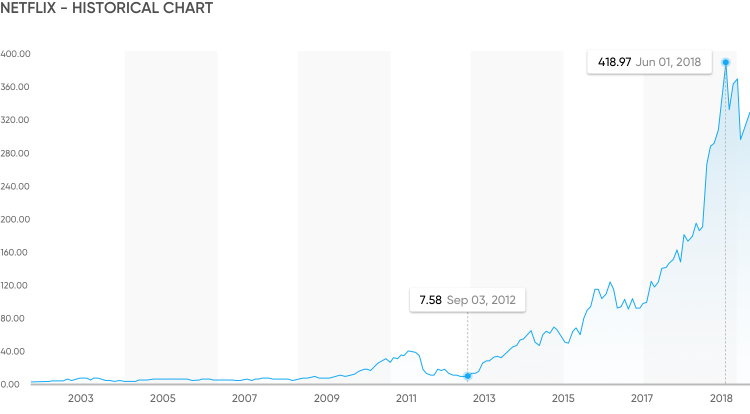 On 29 May 2002, only five years after its foundation, Netflix initiated its Initial Public Offering (IPO), selling 5.5 million shares at $15 (or $1.07 per share after adjusting for stock splits) bringing in $82.5 million. Netflix announced in January 2007 that it would launch video streaming, and a month later delivered its billionth DVD and started to move away from its original core business model of mailing DVDs, by introducing video on demand via the internet. In 2011 Netflix began to expanded the streaming service internationally, by the end of that year it offered service in a lot of North, Central and South America. It began its European expansion in January 2012, launching in the UK and Ireland. Netflix launched House of Cards, its first original content in February 2013, a move that greatly increased the Netflix market share. A US study in late 2017 showed that the number of domestic Netflix subscribers equalled that of all the cable subscribers combined - 73% of all US households. One of Netflix’s biggest competitors is Amazon, since the electronic commerce giant owns one of the other biggest video-distribution services; Amazon Prime – which also offers its own series of shows that are exclusive to the service. Hulu Plus, another American video-streaming service, owned primarily by 21st Century Fox (FOX) and the Walt Disney Company (DIS) – which will eventually become the majority shareholder once Fox has been acquired – is another big competitor. Is Netflix a constituent of any popular indices? Netflix is a constituent of the NASDAQ 100 index, the S&P 100 and 500 index. What factors affect the Netflix stock price? As with any equity, quarterly earnings announcements, as well as the financial performance of the wider stock market are two crucial factors to watch when deciding how Netflix stock will perform. Something more specific to Netflix stock value is its subscription outlook. Subscription numbers are a key indicator for traders to watch, because it is usually a leading indicator of Netflix’s future growth. The number of additional subscribers has the power to send the stock price flying, if it has largely increased - and of course tumbling, if subscription numbers are slowing or declining - as suggested by the Netflix share price history. Another key indicator, specific to Netflix, is the company’s geographic expansion plan. Watching subscription growth rates in countries such as India and South Korea, where Netflix is targeting, can be a key indicator of the company’s performance. Other factors include: outperformance if Netflix outperforms the broadcasting sector in the markets as well as earnings surprises.